Taborgrass Open Mic This Friday, April 5th! Last Open Mic of the Season! This is our last open mic of the season. Come share your stuff on stage with a sound system! Or just come to jam and to support the performers. Either way, hope to see you here! Pizza and jamming starts at 6pm. Performances start at 7pm. Suggested $10 donation. Pizza is $5. Taborgrass Night at Grange #71: This Saturday Night, March 16th! 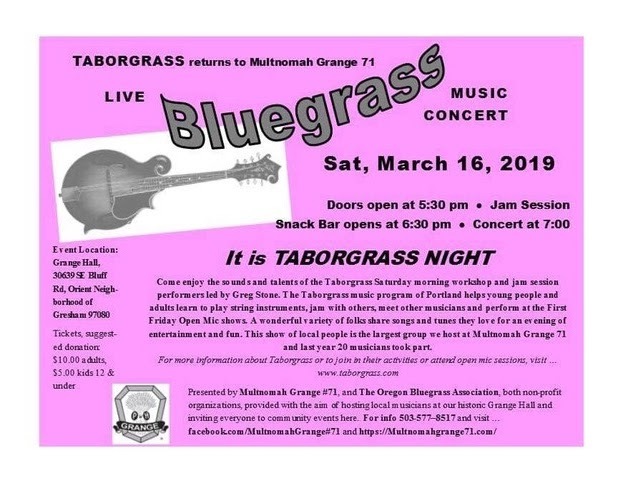 We are pleased to be invited back to the Multnomah Grange this spring for another Taborgrass Night! We invite you to come join us as we look forward to the performances from the Taborgrass Alumni. We also encourage you to sign up and share your music with us. Both classes will be performing this year. Either way, the jamming starts at 5:30 so bring your instrument. The snack bar opens at 6pm. A fire in the wood stove will be roaring, and the show starts at 7pm. It all adds up to lots of fun! Suggested donation to contribute to building costs is ten bucks. Hope to see you there!